The jury is still out as to why hundreds of killer whales (orcas) flock to a location above the continental shelf near Bremer Bay on WA's south coast. A growing band of whale buffs and scientists from across the globe has been flying into Perth, taking connecting flights to Esperance, and chartering a boat to Bremer Canyon. They go to see orcas congregate in huge numbers above the canyon to feed. Film maker and charter operator David Riggs discovered the population several years ago and says they are at the end of a food chain that begins with petroleum leaking onto the ocean floor. Bremer Canyon is long-submerged geological feature comprising the mouths of a river system that existed when sea levels were considerably lower and Australia's shoreline was further south. While part of the canyon falls within a Commonwealth Marine Reserve the orcas' feeding ground is within an expired petroleum lease and therefore outside the Reserve. Mr Riggs has been lobbying the Commonwealth to extend the boundaries of the Marine Reserve to include the orcas' feeding ground. He says a pressurised petroleum reservoir is leaking out somewhere at the bottom of the Canyon and providing food for plankton. According to his reasoning, larger organisms then feed on the plankton and become food for larger organisms and so on until orcas are attracted to this abundant source of prey. Marine biologist Colin Buxton, who was part of an Expert Scientific Panel appointed to review Commonwealth Marine Reserves, says this hypothesis has not been tested. 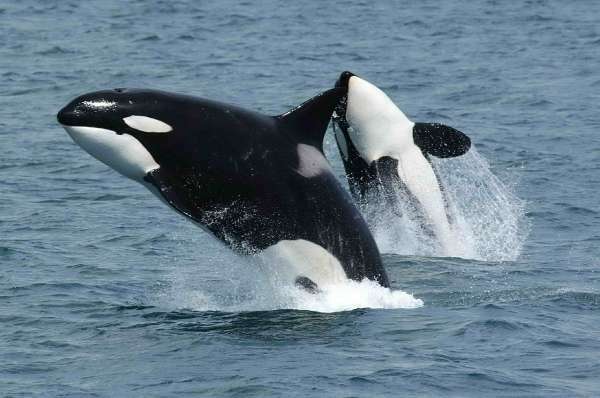 Adjunct Professor Buxton says the review of Marine Reserves included a comprehensive review of existing ecological studies and the orcas' feeding ground has been documented but not studied in any detail. "While it's not documented in our report we do note that hydrocarbon seepage has been documented elsewhere as being a source of primary productivity around the world," he says. "There are several places around the world where hydrocarbon seepage is a natural phenomenon and it's a plausible hypothesis that it could lead to that sort of food chain dynamic." He says an alternative explanation is nutrient-rich water forced up through the canyon by tides or currents. "Cold water upwelling does drive some of our largest fisheries in the world," he says. "Cold water is nutrient rich and once it reaches shallower water up onto the shelf it drives a very large productivity cycle which leads to huge numbers of fish." Whatever the origin of the orcas' feeding ground, the Commonwealth Marine Reserves bioregional advisory panel recommended it be protected. This article first appeared on ScienceNetwork Western Australia a science news website based at Scitech.